DRIVERLESS CARS ARE going to be a part of everyday life and even if you have no intention of ever using one, they may still have an impact on you. A panel of experts from around the world spoke about the future of self-driving vehicles or connected and autonomous vehicles (CAVs) at the Road Safety Authority RSA international conference in Dublin Castle earlier this month. While the conference heard about the positive aspects of CAVs such as eliminating human error on roads – which is the main cause of fatal crashes – it also heard about concerns, including fears around how they could be used for terrorist attacks. Technical director of Competence Assurance Solutions Ltd (CAS) Doctor Charles Johnson spoke to TheJournal.ie about how people who have no interest in driving these cars could still be affected by them. What you’re going to have is a situation where roads are going to be shared by driverless cars and normal cars. That potentially causes all sorts of problems. He said that when you look at the recent American data “the most common cause of collisions is human drivers failing to anticipate what an automated car is going to do”. He added that it’s “quite possible” that people could have to show they can drive with automated cars in their driving test. 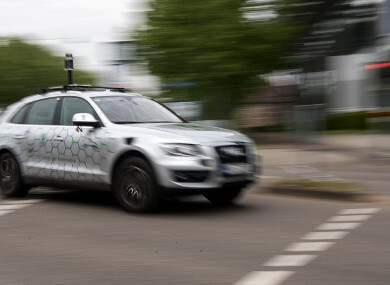 You might have to introduce things about knowing how autonomous cars will drive into the theory test or it might be a requirement that you drive on roads where there is a high proportion of driverless cars so you can show how you can manage it. Johnson also pointed out that the quality of the experience of using driverless cars will be reliant on where you are and what information the vehicle can access. He said that Sat Nav driving in rural Ireland is already “all over the place” and driving CAVs in areas with bad signal will be challenging. On a more serious note, Johnson also spoke about the dangers around CAVs regarding terrorism – considering that vehicles are already being used as weapons. Asked if he thinks automated cars will make things more dangerous than at present, he said: “My short answer to that is yes. “If you think about what terrorists do when they’re using vehicles as weapons, is that they have to go, they tend to hire vans so you’re known as an individual, that usually means that you can only do it once. But what we’re saying here is if you know how to hack into a system, you can hack into it, make a vehicle do something and you can be nowhere in sight when it happens, which makes it easier to be a repeat offender. “They could be doing harm to people in all sorts of ways … and the other thing is it’s not just one vehicle, you could do this to multiple vehicles at the same time. “Just imagine, I might download over the internet into the car system an instruction to hugely break the speed limit the next time that car drives and I could do it for thousands of cars at once. The conference also focused on what needs to be done to maximise the opportunities offered by the new technology. Doctor John McCarthy has over 20 years experience specialising in areas such as connected and autonomous vehicles (CAVs) and he believes Ireland can be at the fore of the technology needed for these cars. The leader of intelligent mobility at engineering consultant firm Arup said there is the potential for Ireland to create 100,000 jobs in this industry in the next 12 – 17 years. He said the jobs would be in a number of areas such as data analytics, artificial intelligence, cloud computing, data centres, risk management and cyber security. He said the foundation for the skills needed is already in Ireland. “For this market we just need to switch it slightly but the foundation of skills is already there. The challenge is gathering them all up together and saying ‘focus on this industry’. “If we don’t do it other countries will do it so that’s why Israel, the Netherlands, the UK, New Zealand, Australis the US are investing massively to be at the forefront of why companies would go there. It’s a mobile phone moment, if you look at what they did in Scandinavia, they said they were going to be the world leaders, you had Nokia, you had Ericson establishing themselves at the forefront, we can do the same. Email “Driverless cars: What will they mean for Ireland's future road safety, jobs and even our driving tests?”. Feedback on “Driverless cars: What will they mean for Ireland's future road safety, jobs and even our driving tests?”.